Talking tough on illegal immigration and violent crime, President Donald Trump appeared Friday to advocate rougher treatment of people in police custody, speaking dismissively of the police practice of shielding the heads of handcuffed suspects as they are being placed in patrol cars. "Don't be too nice," said Trump. He visited Suffolk County, New York, to highlight administration efforts to crack down on illegal immigration and violent crime, and in particular the street gang known as MS-13, which has terrorized communities on Long Island and in other parts of the country. The president urged Congress to find money to pay for 10,000 Immigration and Customs Enforcement officers "so that we can eliminate MS-13." Trump said the administration is removing these gang members from the United States "but we'd like to get them out a lot faster and when you see ... these thugs being thrown into the back of the paddy wagon, you just see them thrown in, rough, I said, 'Please don't be too nice.'" Trump addressed crowds in Long Island Friday where he said the country needs 10,000 more ICE officers. "I said, 'You could take the hand away, OK,'" he said. 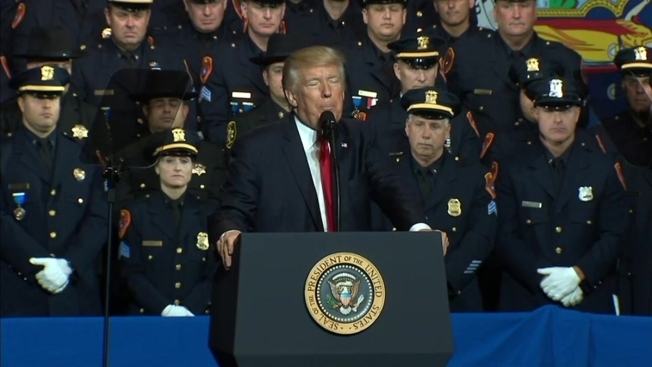 The audience included federal and law enforcement personnel from the New York-New Jersey area, some of whom applauded Trump's remarks. The president offered no details on when and where he would have made those comments. 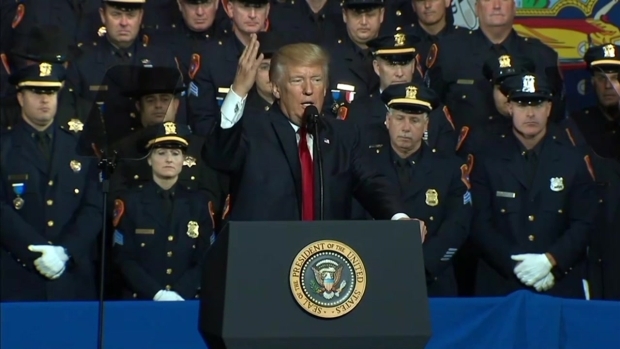 The Suffolk County Police Department said in a statement after Trump's speech that it has strict rules and procedures about how prisoners should be handled. "Violations of those rules and procedures are treated extremely seriously. As a department, we do not and will not tolerate roughing up of prisoners." Trump talks regularly about cracking down on MS-13, or Mara Salvatrucha. The gang is believed to have originated in immigrant communities in Los Angeles in the 1980s and then entrenched itself in Central America when its leaders were deported. It is known for violent tactics that include torturing victims and hacking them with machetes. Authorities estimate the group has tens of thousands of members across Central America and in many U.S. states. Attorney General Jeff Sessions has instructed the Justice Department's law enforcement agencies and federal prosecutors to prioritize the prosecution of MS-13 members, as directed by an executive order Trump signed in February. Since the beginning of 2017, the Department of Homeland Security's investigative unit has arrested 3,311 gang members nationwide during targeted operations, said Tom Homan, acting director of U.S. Immigration and Customs Enforcement. The agency could not provide similar numbers for 2016. 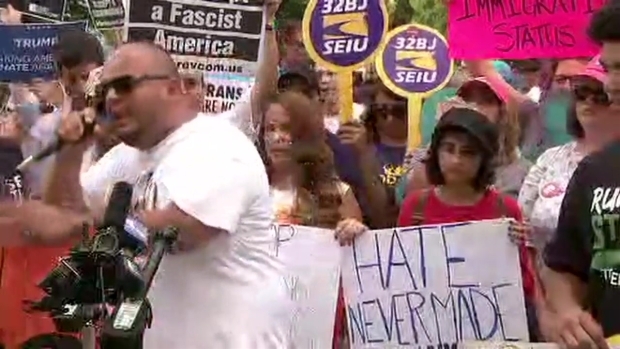 Former gang member Sergio Argueta, founder of youth community and gang prevention group S.T.R.O.N.G, tells Long Island residents why he's glad President Trump is visiting. Trump's visit to his home state of New York came as Sessions was in El Salvador to increase international cooperation against the gang. But the president did not mention Sessions in his remarks. Trump's comments about the treatment of people in police custody resurrected memories of Freddie Gray, a 25-year-old Baltimore man who was shackled but alive when he was put into a Baltimore police van in April 2015. Gray left the vehicle with severe neck injuries, and his subsequent death spawned rioting. Six officers were charged initially, but prosecutors in July 2016 dropped all remaining charges after acquittals and a hung jury. Gray's family agreed in September 2015 to a $6.4 million settlement with Baltimore.